Jim Crow laws maintained racial segregation in the South beginning in the late 1800s. After slavery ended, many whites feared the freedom blacks had. They loathed the idea that it would be possible for African Americans to achieve the same social status as whites if given the same access to employment, healthcare, housing , and education. Already uncomfortable with the gains some blacks made during Reconstruction, whites took issue with such a prospect. As a result, states began to pass laws that placed a number of restrictions on blacks. Collectively, these laws limited black advancement and ultimately gave blacks the status of second-class citizens. Florida became the first state to pass such laws, according to "America's History, Volume 2: Since 1865." In 1887, the Sunshine State issued a series of regulations that required racial segregation in public transportation and other public facilities. By 1890, the South became fully segregated, meaning that blacks had to drink from different water fountains from whites, use different bathrooms from whites and sit apart from whites in movie theaters, restaurants, and buses. They also attended separate schools and lived in separate neighborhoods. Racial apartheid in the United States soon earned the nickname, Jim Crow. The moniker comes from a 19th-century minstrel song called “Jump Jim Crow,” popularized by a minstrel performer named Thomas “Daddy” Rice, who appeared in blackface. The Black Codes, a set of laws Southern states began passing in 1865, after slavery's end, were a precursor to Jim Crow. The codes imposed curfews on blacks, required unemployed blacks to be jailed and mandated that they get white sponsors to live in town or passes from their employers, if they worked in agriculture. The Black Codes even made it difficult for African Americans to hold meetings of any kind, including church services. Blacks who violated these laws could be fined, jailed, if they could not pay the fines, or required to perform forced labor, just as they had while enslaved. Essentially, the codes recreated slavery-like conditions. Legislation such as the Civil Rights Act of 1866 and the Fourteenth and Fifteenth amendments sought to grant more liberties to African Americans. These laws, however, focused on citizenship and suffrage and did not prevent the enactment of Jim Crow laws years later. Segregation did not only function to keep society racially stratified but also resulted in homegrown terrorism against blacks. African Americans who did not obey Jim Crow laws could be beaten, jailed, maimed or lynched. But a black person needn't flout Jim Crow laws to become a target of violent white racism. Black people who carried themselves with dignity, thrived economically, pursued education, dared to exercise their right to vote or rejected the sexual advances of whites could all be targets of white racism. In fact, a black person needn't do anything at all to be victimized in this manner. If a white person simply didn't like the look of a black person, that African American could lose everything, including his life. The Supreme Court case Plessy v. Ferguson (1896) constituted the first major legal challenge to Jim Crow. The plaintiff in the case, Homer Plessy, a Louisiana Creole, was a shoemaker and activist who sat in a whites-only train car, for which he was arrested (as he and fellow activists planned). He fought his removal from the car all the way to the high court, which ultimately decided that "separate but equal" accommodations for blacks and whites weren't discriminatory. Plessy, who died in 1925, would not live to see this ruling overturned by the landmark Supreme Court case Brown v. Board of Education (1954), which found that segregation was indeed discriminatory. Although this case focused on segregated schools, it led to the reversal of laws that enforced segregation in city parks, public beaches, public housing, interstate and intrastate travel and elsewhere. Rosa Parks famously challenged racial segregation on city buses in Montgomery, Ala., when she refused to relinquish her seat to a white man on Dec. 1, 1955. Her arrest sparked the 381-day Montgomery Bus Boycott. While Parks challenged segregation on city buses, the activists known as the Freedom Riders challenged Jim Crow in interstate travel in 1961. Although racial segregation is illegal today, the United States continues to be a racially stratified society. Black and brown children are much more likely to attend schools with other black and brown children than they are with whites. Schools today are, in fact, more segregated than they were in the 1970s. Residential areas in the U.S. mostly remain segregated as well, and the high numbers of black men in prison mean that a large swathe of the African American population does not have its freedom and is disenfranchised, to boot. 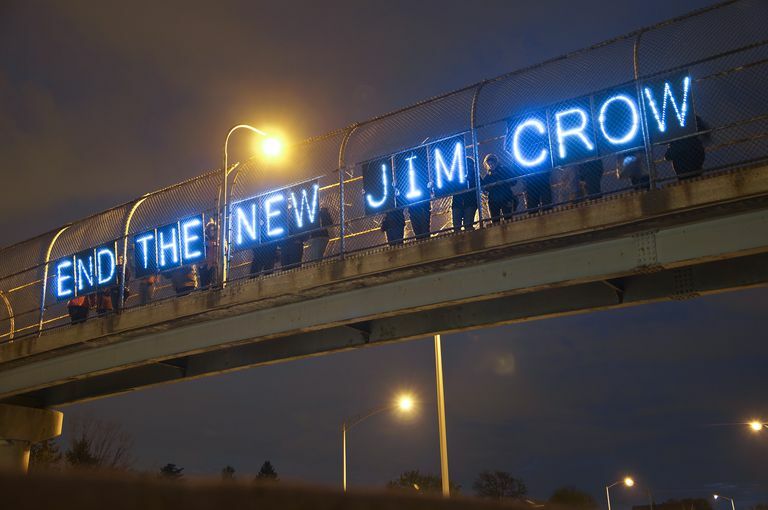 Scholar Michelle Alexander coined the term the "New Jim Crow" to describe this phenomenon. Similarly, laws that target undocumented immigrants have led to the introduction of the term "Juan Crow." Anti-immigrant bills passed in states such as California, Arizona, and Alabama in recent decades have resulted in unauthorized immigrants living in the shadows, subject to shoddy working conditions, predatory landlords, a lack of healthcare, sexual assault, domestic violence and more. Although some of these laws have been struck down or largely gutted, their passage in various states have created a hostile climate that makes undocumented immigrants feel dehumanized. Jim Crow is a ghost of what it once was but racial divisions continue to characterize American life.